Background: The objectives of the study were to determine whether consumers who read food labels, were also more aware of health and lifestyle issues, in terms of nutrition and other health-related lifestyle behaviours, and whether there was a relationship between food-label reading, health awareness and lifestyle behaviour. 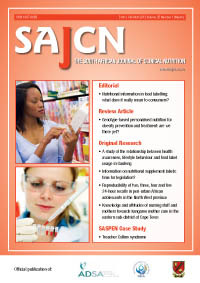 A quantitative descriptive (survey) design was selected to investigate the relationship between food-label reading on the one hand, and health awareness and lifestyle behavior on the other. Method: A two-stage, stratified-proportionate and systematic sampling strategy was applied to select a sample of 357 Gauteng respondents to complete a telephonic questionnaire. Respondents who were most likely to read food label information were selected. Food label information is prescribed by comprehensive label legislation. Data report on respondents’ label-reading habits, attitudes towards health awareness, lifestyle behaviour and biographic data. Nonparametric analysis, scale reliability tests, analysis of variance (ANOVA) and Bonferroni multiple comparisons of means tests were used to analyse the results. Results: Results indicate that the two-thirds of respondents who, to some extent read nutritional information on food labels, were concerned about their personal health, were interested in health-related information, and followed a healthy lifestyle, such as regularly eating fresh fruit and vegetables, cutting back on alcohol, and other positive lifestyle behaviours. They were unsure about how their own knowledge of nutrition, and their understanding of nutrition information on food labels, compared with that of other consumers. Conclusion: A relationship was found between patterns of reading food labels, health awareness and lifestyle behaviour. People who often read food labels were more health-conscious, and maintained a healthier lifestyle.